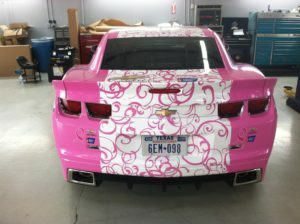 Custom vehicle wraps are the quickest, easiest way to customize the look, style, and color of your vehicle affordably. With a wide range of colors and textures to choose from, there is virtually no limit to the possible graphic design combinations we can come up with! 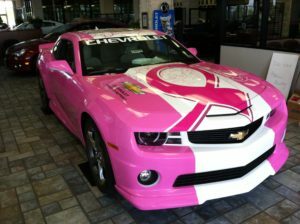 Personal car wraps can quickly change the color of your entire car or be used to add customized graphics and bold visual statements. Not only can we change the color of your entire car, we can accent certain parts and can mix any number of vinyl colors with different textures or graphics, including racing stripes, camo, or personalized decals. The possibilities are endless! Vehicle wraps won’t cause harm to your vehicle’s factory paint, and will actually provide extra protection against damage from harmful UV rays, dirt and small debris. We offer a very wide selection of specialty film wrap colors, or our design team can provide you with a complete custom design! Once we have determined the ideal color for your vehicle, we can determine the right texture for your particular wants and needs. We can customize your color with a variety of textures including satin or matte, metallic or chrome, and even brushed steel! Once we have your color and texture established, we can determine the total coverage area based on your needs and budget. By working closely with you through every step of the process, we are able to ensure your total satisfaction and stay within budget, giving you peace of mind in knowing you have all the available information before we proceed with the process of wrapping your vehicle. Updated on September 19, 2018 at 9:08 pm by Metroplex Wraps.